It was after 11 p.m. Saturday by the time I was finally able to sleep. I had been awake for almost 24 continuous hours, barring some bad sleep on a plane. My trip back to D.C. had involved a long-distance ICE train, two planes, an airport shuttle, a bus, a subway and a taxi. I was exhausted and sore and still I’d rarely felt more personally satisfied. I’d spent the last week away, first in New York City for a day visiting a friend, then in Germany over Thanksgiving. It was the first time I had traveled abroad on my own, without going (back) to school or doing something for work. I’d done a European circuit in college with my best friend and had just gone to Sweden with that same friend. But this was different. It felt riskier — apart from simply wanting to go, I had no good “reason” to, no justification. It felt empowering. I planned and booked the entire thing myself, asking some advice from friends who’d been to the cities I was visiting. I ditched my normally strict tendency to plan every day to the detail, and just did what felt right, whatever I wanted to at any given time. One day this involved eating a plate-sized Schnitzel with fried potatoes and a Frankfurt-style green herb sauce, washing it down with half a liter of beer (that was somehow the smallest glass available). I ended up visiting a modern art museum, wandering around Frankfurt’s Dom before the sun had risen, strolling through a giant food hall. 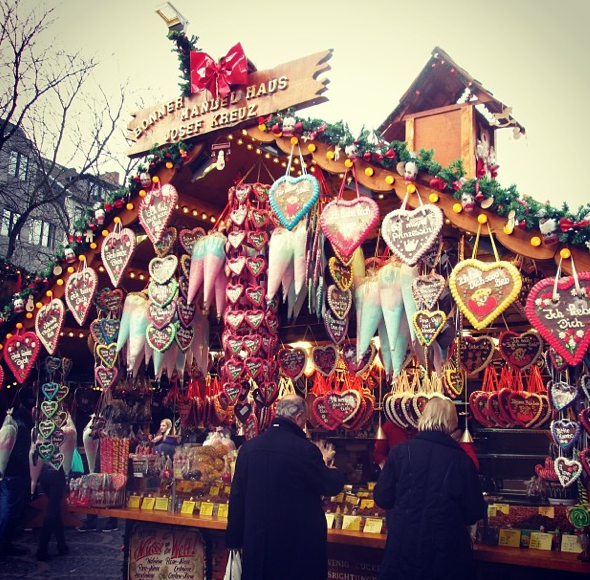 I went to Bonn for a day and wandered around its Münsterplatz, which was packed with stalls for the annual Christmas market. I found a present for my mother, ate sweets from the stalls and just took in the atmosphere. Thanksgiving morning, I sat alone in an empty first-class train compartment as we zipped through early-morning fog. I saw glimpses of little villages along the river, buildings that looked ancient and sleepy. I wondered, sleepy myself, what it might be like to chuck it all in and settle down in some little burg. 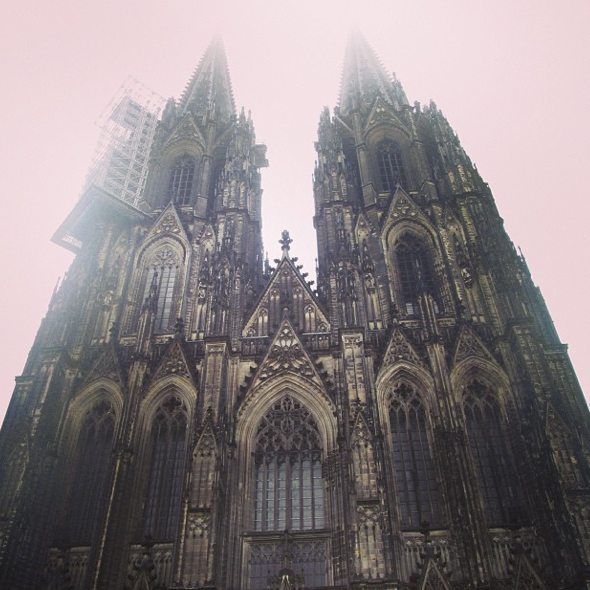 When the train arrived in Cologne, my last stop, the first place I went after dropping off my luggage was to the Dom. More than any other cathedral I’ve seen apart from perhaps York’s minster, it evokes the phrase “pillar of the Earth.” Photos of it, though I took several, do it no justice. It is simply mind-boggling in its enormity and it amazes me that the people living in Cologne must just get used to it, like a stone Godzilla just sitting there. 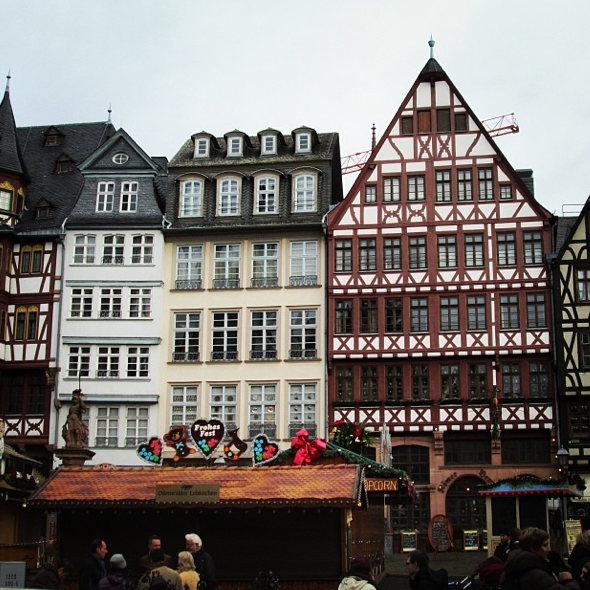 Cologne’s Christmas market seemed to go on forever; it actually has several of them and they just bleed into each other. I had mulled wine and hot potato cakes covered in apple sauce. Everywhere there are sausages, sandwiches, cookies, cakes, pretzels, wine, hot chocolate and arts and crafts. At night, with the strung-up lights illuminating the sky and the Dom in the background, it’s downright ethereal. I perused Cologne’s Greco-Roman Museum in the afternoon, admiring the mosaics, jewelry and pottery on display. Later that night, I went on a date and ended up drinking Kölsch in a Brauhaus and sipping hot mulled wine in the Christmas market, snuggling up to stay warm. Thanksgiving indeed. I’m in that buzzkill-ish period right after a trip, when it’s over and done and you just think, “Well now what?” But going on this trip, short though it was and to a place I’d been before where I more or less knew the language, gave me a lot of confidence. It might be the introvert in me, but I really believe that you have to be able to manage on your own before you can manage with anyone else. So for that reason I enjoyed my taste of solo travel (although I still plan to travel with friends, obviously), and I feel brave enough to do it again. It was also exhilarating to go somewhere just to go, because I could, without it being for school or anything else or anyone else but me. I think I owed myself that. Read about the first, second and third days in Paris. Monday, our long weekend in Paris came to a close. Lauren and I rode the Metro to Gare du Nord and stashed our bags in a locker, so they’d be safe and we wouldn’t have to carry them . We had breakfast — crepes, coffee and apple juice — at a cafe by the train station. We spent the rest of the morning and early afternoon up in Monmarte, visiting the beautiful Sacre Coeur basilica, which is on a hill and can be seen from across the city, and walking around the district. We stopped outside the Moulin Rouge for photos. We had heard about good flea and farmers markets in Marais, but unfortunately the ones in which we were interested were closed. Our next stop was the area around the national opera. After taking photos of the building’s exterior (the interior of lovely also), we visited the Apple store for the free WiFi and got coffee at a very opulent Starbucks. We’re talking chandeliers, tiles ceilings, shiny metal fixtures. It was swank. I also dragged Lauren into the United Colors of Benetton and picked up my souvenir of the trip — a UCoB shirt with “Paris” on it. I have one from London, too. It may just be my new collection. With the afternoon left to kill, we went back to the Eiffel Tower so Lauren could see it in the daylight. It was so cloudy out that going to the top would have been pointless, as the view would have been obscured, so we hung around down at the bottom, took photos and watched souvenir peddlers run away from the police. Good times. We walked across the Seine to the Trocadero, a complex of gardens and museums. The complex has an impressive history in international affairs — the Universal Declaration of Human Rights was signed there in 1948, and it also housed the first headquarters of NATO. Lauren and I had one last late lunch together in a restaurant off the Trocadero, before heading back to Gare du Nord. I set up shop in a cafe with a coffee and a croissant, waiting for my train depart. Lauren took an overground commuter train to Orly, from where she was flying back to Germany. So there you have it. Four eventful days in Paris. Très bon, oui? My friends (Deborah, Hannah and Rachel) and I had planned to head up north to Whitstable, a small satellite village on the North Sea renowned for its oysters, today. After a couple of weeks of drippy, overcast weather, we couldn’t have expected a truly gorgeous day, as you can tell from the photos at the bottom. After a lovely Anglican service early this afternoon in Eliot Chapel (during which I read the liturgy and after which I indulged in some lemon cake a few local ladies brought in), I met up with my friends and packed into Deb’s car and drove up to Whitstable. The beach there reminded me a lot of Maine — more rocky than sandy, windy and cool. We didn’t swim, obviously, but I’d wager it was chilly. Lines of lovely houses, some private, some turned into bed-and-breakfasts, stood up and down the seaside. You could see people swimming and on their boats. I lost track of the number of dogs: spaniels, terriers, retrievers, labs and shepherds of all kinds, some on leashes, some not, all well-behaved. We also found oyster shells to collect. Up the beach is Whitstable Harbour, which has a fish market and several fresh seafood restaurants. A few boys were catching nice-sized crabs right off the pier using nets. We headed into the town centre, passing all sorts of little shops, cafes and pubs. When we’d exhausted the high street options, we settled in for a late lunch at Coach and Horses. All four of us had a typical “Sunday roast” dinner: Beef (cauliflower-and-cheese bake for Hannah), yorkshire pudding (not really pudding; it’s a pastry used to sop gravy), roasted potatoes and vegetables. On the way back, we stopped for a few minutes at a penny arcade (I won some sort of magnet game) and then at a little ice cream parlor called Sundae Sundae, where we got cheap waffle cones. Then we had a nice leisurely walk back up the beach to the car. All in all, a lovely day, and it makes me want to go back to Whitstable on a Saturday morning (the buses go there) for the farmers market. Perhaps most importantly, the evidence of an actual beach in England torpedoes my uncle Tim’s rationale for not coming over in July to see my graduation. Note: The period from now until December is VERY busy! So be sure to check back for photos and news from Bodiam Castle and Rye, Guy Fawkes night, Harry Potter & the Deathly Hallows, Bruges and Paris.